Magnet Racing Saturday March 26, 2016 at Yellow Dog Raceway. We began the day with 14 racers for 3 classes of races. Results were not printed and manual sheet was not complete. A good afternoon for racing enjoyed by all. A big THANKS goes out to NICK from SUPERTIRES for the RAFFLES. And that's from all the racers. Thanks to Ron for the track, the time, and also for his help for quick fixes on cars needing pit repairs during races. Thanks also to those teching the cars and manning the computer. Fritz 77.70 FIRST win ever !!! Last edited by bobbyraz49; 04-17-2016, 05:12 PM. To all Super Tires supporters, racers, guests or tourists on S.C.I. just passing through. Super Tires is a proud sponsor of races at Ace Hobby Shop. tires were first tested, the rest is history. to post our decal give-a-way to all readers on this thread. This Saturday will be the 4 Car enduro race!! There is a New Magnet Racing Season starting at Ace Hobbies underway. Nick of "Super Tires" came and brought in Ron's latest order of Tires with him, along with his Step-Son and Grand Son to race Magnet cars. Nick made the offer of paying the first $15 off of the first car that anyone who bought a New Car at Ace on Saturday while he was there. THANK YOU NICK!! A great time indeed ! WTG Steve on the posting ! This Saturday was a Momentous one at Ace Hobbies. It was the day that the new HO track that Russ built in his basement was brought to Ace Hobbies. We need to thank Ron for providing the space for the new HO Track in the Back corner in the shop where he keeps most of the books and other reference materials. The following people were at Russ's that helped in moving the track up and out of Russ's basement: Russ, Alex, Marsh, Kevin, Troy and myself. The platform that the track was built on is 16 Feet long, 3 Feet wide on one end, 4 feet wide at the other end. After a couple of attempts to try to get the track out and discovering that it had to be different, we managed to just barely squeeze the track outside and onto Troy's 14 ft. bed trailer. The track was finally put wrapped with a tarp onto the trailer sticking out the front. Luckily the hitch on the trailer was far enough forward so that the track cleared Troy's SUV. The new HO track is a 4 lane long Figure 8 configuration with Banked turns at each End. There are a couple of Esses at and just past the under-pass for the 8. Each lane is within an inch of length of each other. There is no track race information system on it yet, but the track is open for any one to practice on using the same controllers that are used on the big Yellow Dog Raceway in the other room. The track was soon being tested by everyone at Ace Hobbies at the time using some of Russ's HO Cars. Nick of "SuperTires" was in attendance and soon offered to pay $15 toward the purchase of a new slot car on Saturday to anyone who there at that time. Thank you Nick! Nick then offered $25 in Ace Hobbies Credits to the winner of a drawing of the first 3 Finishers of the first race which was for Tans-Am cars. Thank You Again, Nick! Everyone else in that first race were given $10 in Ace Hobbies Credits. After the second race for GT cars was organized, Nick gave all the racers $10 in Ace Hobbies Credits. Thank You Once Again, Nick! There were no printouts for fastest laps in either race. It is rumored that Nick of "SuperTires" fame will be bringin his grandkids to Ace Hobbies to race their Magnet Cars this Saturday, November 4, 2017. They will probably race Magnet GT's and possibly Magnet Trans-Am's. There is another rumor that the "monthly" "Four Car Enduro" will be on Saturday, November 11, 2017. 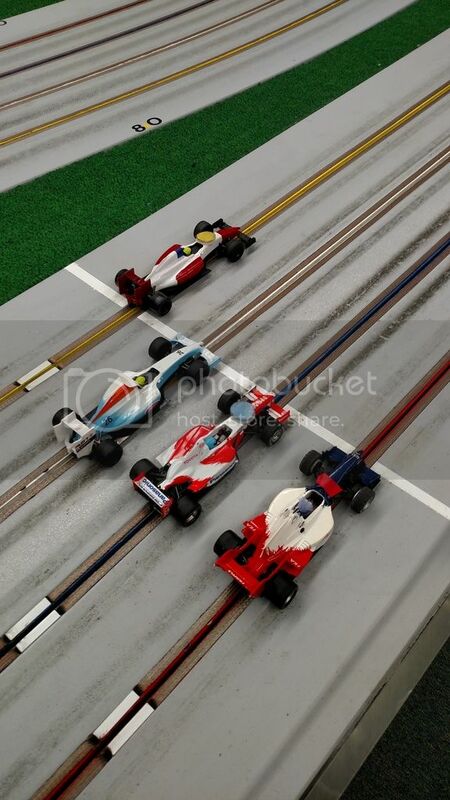 Everyone is encouraged to take part in the Monthly raffle for a Slot-It slot car. Tickets are available 1 for $1.00, 7 for $5.00, and 15 for $10.00 if I remember right. If you have been to Ace Hobbies over the last few month's, you couldn't have help but notice the new plastic track slowly being set up as you walk into the store. When I came in this week on Monday, I noticed that the guys setting up the track had done a quite a bit work on the track and Ron confirmed that the track is ready to have organized races on it. Apparently the computer to it has been set up with at least a temporary lap counting system. There is probably a bit more work to do to have a permanent start fine line set-up but Ron says its ready to have some organized racing. Therefore, if enough people come on Saturday, there will be an effort to have some organized Races on Saturday Afternoon. Ron also indicated earlier that he might be willing to stay open any night of the week to accommodate magnet racing on one night a week, so let him know that you might be interested for one night a week and what night you would like to have it and it could be put to a vote in a few weeks.